Children go to a soup kitchen in Texas in 2009. By 2010, as many as 500,000 U.S. children may be homeless, a report says. (CNN) -- About 21 percent of children in the United States will be living below the poverty line in 2010, the highest rate in 20 years, according to a new analysis of children's well-being released Tuesday. The study, funded by the private philanthropy Foundation for Child Development, found that families' economic well-being has plummeted to near 1975 levels, said Kenneth Land, project coordinator and professor of sociology and demography at Duke University. "Virtually all of that progress is wiped out through job losses, through declines in real income, and other aspects of family economic well-being," Land said. The Child and Youth Well-Being Index Project at Duke University bases its predictions on 28 indicators of well-being that encompass economic well-being, safe and risky behavior, social relationships, emotional and spiritual well-being, community engagement, educational attainment and health. 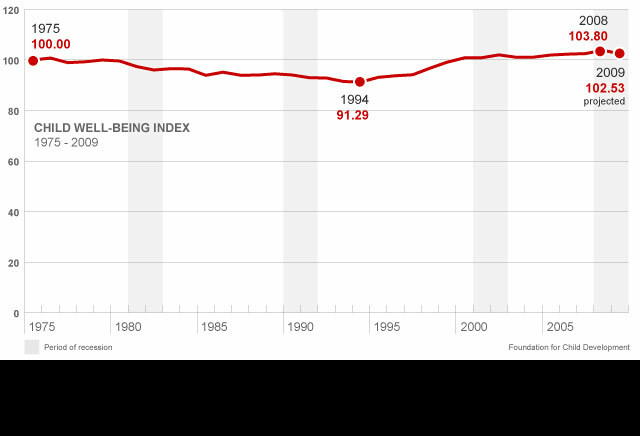 Researchers predict that although the index is at a low for the decade this year, it will start edging up. "There are lots of kids out there whose quality of life has already and will decline as a result of the impact of this recession," Land said. About 15.6 million children are estimated to be living in poverty this year, but study authors say this number will start going down. This year, as many as 500,000 children may be homeless in the United States, according to the report. Children living in families in which neither parent has secure employment will rise to about 20 million this year, up 4 percent from 2006. Also, many children live in households where all members do not have access to enough safe and nutritious foods. From 2007 to 2010, an additional 750,000 children are estimated to live in food-insecure households, the report said. There is also potential for an uptick in obesity as families with tight budgets move toward lower quality food because of the recession, Land said. Healthy foods tend to be expensive, while processed and fast foods are cheaper and more readily available to some families. Community engagement will go down as school districts reduce the employment of teachers and cut back programs. The amount of time spent in school may even go down; in 2009, Hawaii became the first state to move to four-day school weeks to save money in the recession. One piece of good news is that health insurance coverage for children will not significantly fall, the report said, thanks to publicly financed health care programs. About 90 percent of children will be in families with some form of health insurance, the report said. Chaotic childhoods have enormous implications for physical health, said Dr. Alan Kazdin, professor of psychology at Yale University and researcher at the Yale Child Conduct Clinic. Higher rates of cancer, liver disease, respiratory disease and other conditions have been found in people who grew up under stressful conditions, said Kazdin, who was not involved in the study. Families can take some steps to help children's well-being even in difficult economic times, he said. They should try to keep or even increase family routines such as taking walks in the park, grocery shopping, and eating meals together, Kazdin said. Matthew Stagner, director of the University of Chicago's Chapin Hall Center for Children, views the study as important but not surprising. He noted also that some of the trends described, in terms of family relationships and other indicators, are not necessarily caused by the recession. The report's prediction that indicators of family economic well-being will "bottom out" in 2010 will depend on the length of the recession and the state of the overall economy, Stagner said. The indicators are good but fairly limited, Stagner said. He would like to see data on more issues pertaining to children -- namely, school readiness. "We don't have a national survey that really gets at the issues of whether children are ready to go to school," he said. Educational attainment in the current report is one indicator that has essentially remained flat since 1975, Land said. The decrease in the family economic indicators will likely impact children's abilities in reading and math, and the deterioration in academic performance will have long-lasting effects, he said. "This will show up subsequently in their careers and losses of income and ability to compete in the workplace," he said.